Everybody knows about ketchup, mayonnaise, and garlic sauce. But what about hollandaise and bearnaise sauces? Wouldn’t either one of these impress your dinner guests? Not to mention make them lick their fingers. However, you have to make sure you know which is which and what to serve them with. Here is an article to help you out! Hollandaise sauce is one of the five important sauces of the French haute cuisine. Therefore, if you master it, you can take great pride in your accomplishment. It consists of an emulsion of egg yolks and liquid butter, to which you add lemon juice, salt, and white pepper. The sauce comes out pale yellow, smooth, and creamy. Hollandaise sauce is an ingredient in the well known eggs Benedict recipe. It goes very well with poached fish and steamed asparagus. Although you might say the sauce is of Dutch origin, this is not certain. The name is attributed to a shortage of butter during the First World War, which led to the replacement of French butter with its Dutch counterpart. However, French literature has numerous references to a similar sauce dating back earlier than the 20th century. Therefore, the debate continues. Bearnaise sauce is thought to be a spin-off of hollandaise sauce and it was created in the French Bearn region. It too is one of the five French mother sauces. It is made with clarified butter emulsified in egg yolks, white wine vinegar, and herbs. You then add shallots, chervil, peppercorns, and tarragon. These ingredients are later strained out so as to not affect the creamy texture of the sauce. The resulting sauce is thick yet creamy and smooth, and yellow in color. It is best served with meats. So what is the difference between hollandaise and bearnaise sauce? First, there is the issue of time of origin. 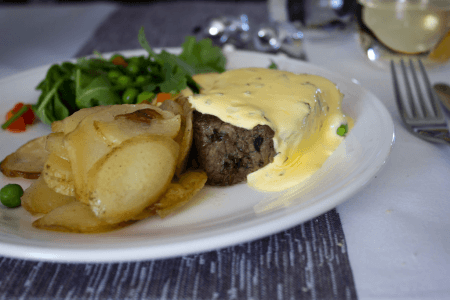 Although its origins are unclear, hollandaise sauce is thought to have come before the bearnaise sauce, making the later a version of the first. Secondly, while the base ingredients are the same – namely eggs and butter – the preparation and added flavors differ. 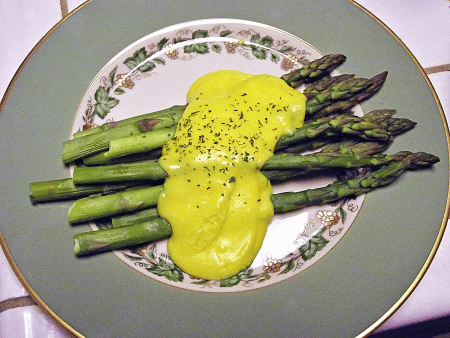 Hollandaise sauce is made with an emulsion of egg yolks and liquid butter. The base for bearnaise sauce is made with clarified butter emulsified in egg yolks, white wine vinegar, and herbs. Next, only lemon juice, salt, and white pepper are added to give more flavor to the hollandaise. For bearnaise sauce, you add shallots, chervil, peppercorns, and tarragon, which are later strained out. Both sauces come out yellow, smooth and creamy, although hollandaise sauce tends to be thicker than bearnaise which is emulsified with vinegar. Hollandaise is best served with vegetables and eggs. Bearnaise, however, pairs well with meat and fish.